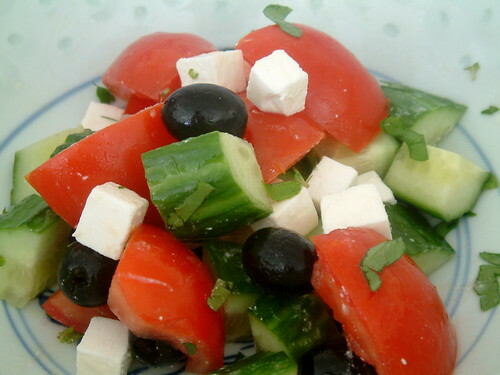 That greek salad might be perfect for a picnic / shakespeare play in the park event I am going to this weekend! I love this salad. Simple and delicious, healthy, refreshing… Perfect, Wendy! I’ve only been to Athens, but I would love to go to any of the Greek islands! Someday. Your photos are just amazing and all this food looks fantastic. Garret – Love outdoor Shakespeare. Have fun! Patricia – It’s a favourite of mine too. I like chunky food. Thanks for putting me in a dream state this afternoon. It is a lovely summer day and I have some really nice new age soothing music playing in the background. Now I read about your trip and ahhhhh! I am ready to go! Back to your food. Wonderful! Now pair those great dishes up with a nice Spanish wine we have been talking about and you have one superb dinner! That picture and your story makes me really, really farsick! 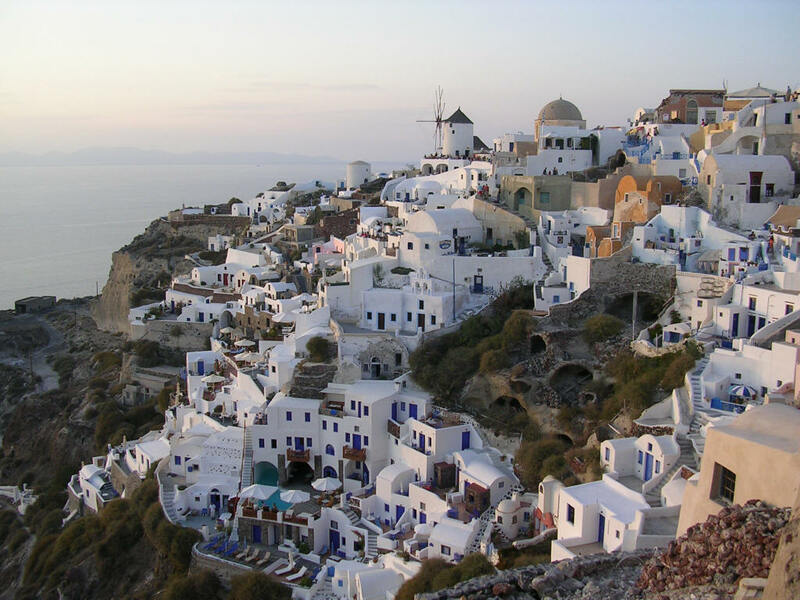 I’ve never been to Greece and have wanted to go for years…. soon. What time did you say dinner is? It all looks wonderful! I love the honey/lemon marinade. Jen – Thank you so much! Katiez – I’d never heard the expression “farsick” before. Understand it completely though! The great thing about the honey in the marinade is that the meat caramelises, eventually turning a beautiful golden colour. Wendy, such a lovely post. I like to take breaks on the spur of the moment, but work & other commitments currently prevents me from being very spontaneous. Your meal fro your aunt & uncle sounds good. Do you like taramasalata? I love that stuff. Love those grannies! Nine books in seven days. Egads! Perfect place in which to do so. love your stories of greece – I have never been there and would love to – but I think i would have a very sore and sunburnt back if I lay in the sun a week. And isn’t it wonderful how food can take you back to a place or time! Your salad looks so fresh and colourful. Nora B – Thank you! I’ve only had taramasalata once years ago and I wasn’t keen on it. It was an odd pink, for starters! My palate has changed though. Will try it again soon on your recommendation. Lucy – It was a marathon session! Some of them were trashy thrillers, easy to race through. Remember reading Paul Theroux’s “Hotel Honolulu” though. It’s still one of my favourites. Cynthia – It was lovely. Recommend a visit someday. Maninas – You’re right – it was very much like something out of a sitcom! LOVE this post (as was expected, right?) 🙂 Awww the stray cats and the chilled wine …. and that Greek salad looks just like the ones we ate there! I think I’ll make this this weekend. As always, thanks for drawing me in with your mouthwatering pictures and eloquent descriptions. Delicious post! I’m so happy to include it in Blog or Bust! Thank you!! Wendy – Thank you for visiting my blog and for leaving a message, leading me to your fabulous blog. 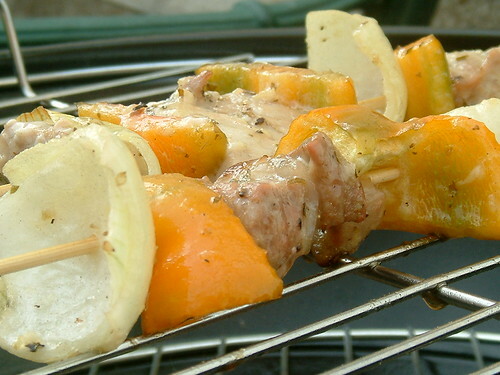 I love pork and citrus, so you’re souvlaki is appeals to me. I must give this a go as I do not “do” enough with pork. Robin – Thank you! Look forward to reading the round up. Pictures and accounts of Santorini always brings fond memories. It is a magical place. Great recipes! Wendy I love this post. It brought me right back to the time I spent on Santorini one November. Oia was totally deserted, lots of stray cats and dogs, and an inexplicable crowd out of no where at sunset each night! Where did they come from? But it’s a stunning place isn’t it? Love these recipes. Tartlette – Thank you! And totally agree! Figs Olives and Wine – Thank you too! Have no idea where the crowds came from either. I just adored how the town sprawled down the cliff face. It’s really one of the most dramatic villages ever! I wrote a little something about it too – actually about a restaurant directly below it at the bottom of the cliff (Sunset Taverna maybe? )… did you go? If you feel like it, it’s the Grilled Squid & Ramp Salad post in my May archives. You have taken me back to Spring of last year. I spen 5 weeks in Greece. My first 4 days were on Santorini with my daughter. We had delicious pasta at a restaurant called Stromboli’s in Oia with a cat in my lap. I had my first Greek yogurt waiting for the traditional caique to take us out to Nea Kemeni and for a tour to Thirassia and a jump overboard to the hot springs. I enjoyed the memopries your post brought back…the food too of course. I can always remeber a place by the food I ate, the restaurants I visited. Keep posting!!!! !